You might have seen people posting about the Spooky Facebook Frenzy. 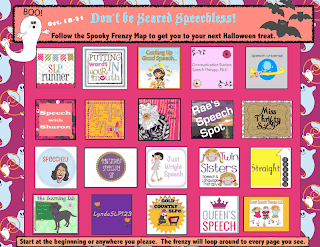 This is going to be an awesome way to grab some fun Halloween themed freebie speech and language items! All you have to do is go to the Facebook pages of the pages participating and click on the icon that looks like the one above. This will take you to a page that directs you to either "like" the page to get to the freebie, or it will show you an image that includes a link to the freebie if you already "like" the page. Here is a link to a map of all of the participating pages: Spooky Facebook Frenzy (this link will take you to a google doc where you can highlight each page to click and link you to Facebook). Once you start, you will be able to just click on a pumpkin to take you to the next page for another freebie. You can start the hop by going to my (or any participating) Facebook page and click on the Spooky Facebook Frenzy button. The Facebook Frenzy will last from Oct. 18-21.